The Wallace Grande Baroque 66-Piece Sterling Flatware Set with Dessert Spoon features beautiful flowers and leaves, expressing a love of adventure, luxury and romance. This flatware set includes: 12 salad forks, 12 place forks, 12 place knives, 12 place spoons and 12 dessert spoons. The set also includes a 6-piece hostess helper set with 1 tablespoon, 1 pierced tablespoon, 1 sugar spoon, 1 butter knife and 1 pie server. This 66-piece flatware set includes a full service for twelve. 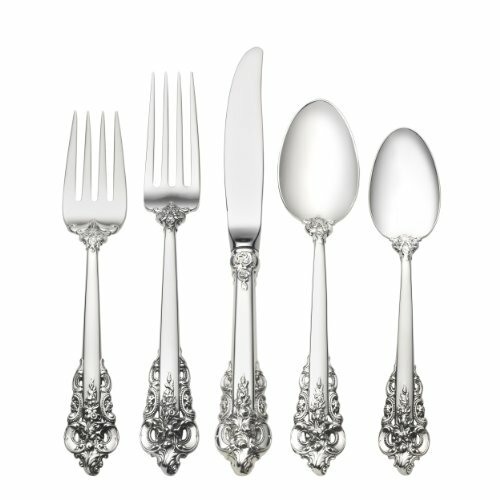 The flatware in this set is made from fine sterling silver. For proper maintenance, pieces should be polished once or twice a year, whether or not they have been used regularly, in order to maintain their shine. These pieces should be hand-washed only; hand wash and dry immediately with a chamois or soft cotton cloth to avoid spotting. W1066650 Features: -This intricately decorated pattern features beautiful flowers and leaves.-Expressing a love of adventure, luxury and romance.-Material: Sterling Silver. Collection: -Complements the Grande Baroque collection. Disclaimer: -Please Note: This item cannot ship to Alaska, Hawaii, or Puerto Rico. We apologize for the inconvenience. If you would like assistance finding an item that can ship to Alaska, Hawaii, or Puerto Rico, please contact our customer service team.. The Wallace Grande Baroque 66-Piece Sterling Flatware Set with Cream Soup Spoon features beautiful flowers and leaves, expressing a love of adventure, luxury and romance. This flatware set includes: 12 salad forks, 12 place forks, 12 place knives, 12 place spoons and 12 cream soup spoons. The set also includes a 6-piece hostess helper set with 1 tablespoon, 1 pierced tablespoon, 1 sugar spoon, 1 butter knife and 1 pie server. This 66-piece flatware set includes a full service for twelve. 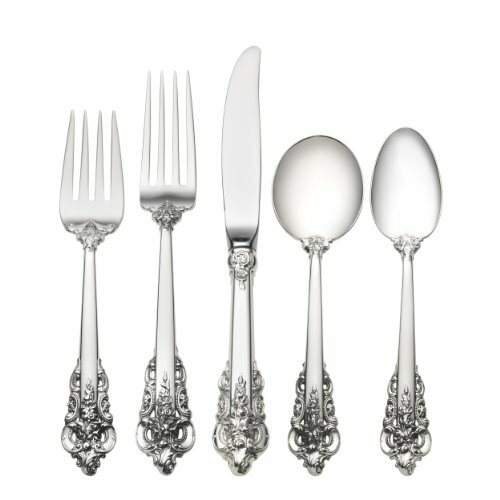 The flatware in this set is made from fine sterling silver. For proper maintenance, pieces should be polished once or twice a year, whether or not they have been used regularly, in order to maintain their shine. These pieces should be hand-washed only; hand wash and dry immediately with a chamois or soft cotton cloth to avoid spotting. 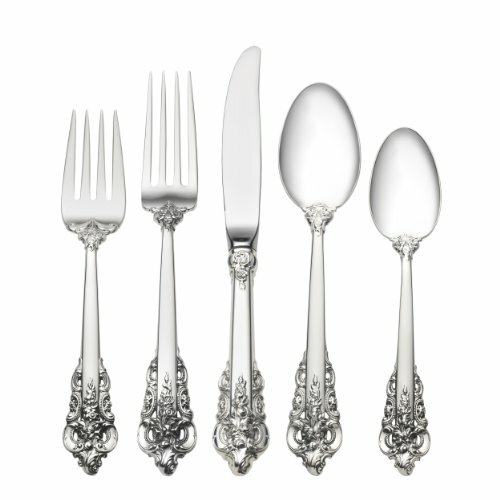 The Wallace Grande Baroque 66-Piece Sterling Flatware Set features beautiful flowers and leaves, expressing a love of adventure, luxury and romance. This flatware set includes: 12 salad forks, 12 place forks, 12 place knives, 12 place spoons and 12 teaspoons. The set also includes a 6-piece hostess helper set with 1 tablespoon, 1 pierced tablespoon, 1 sugar spoon, 1 butter knife and 1 pie server. This 66-piece flatware set includes a full service for twelve. 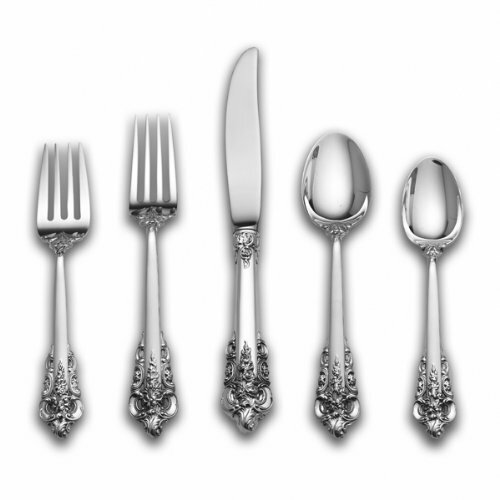 The flatware in this set is made from fine sterling silver. For proper maintenance, pieces should be polished once or twice a year, whether or not they have been used regularly, in order to maintain their shine. These pieces should be hand-washed only; hand wash and dry immediately with a chamois or soft cotton cloth to avoid spotting. The Wallace Grande Baroque 66-Piece Sterling Flatware Set features beautiful flowers and leaves, expressing a love of adventure, luxury and romance. This flatware set includes: 12 salad forks, 12 dinner forks, 12 dinner knives, 12 dinner spoons and 12 teaspoons. The set also includes a 6-piece hostess helper set with 1 tablespoon, 1 pierced tablespoon, 1 sugar spoon, 1 butter knife and 1 pie server. This 66-piece flatware set includes a full service for twelve. 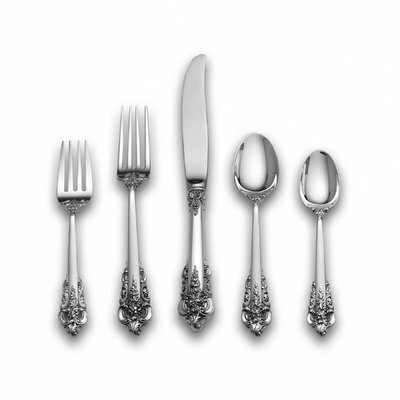 The flatware in this set is made from fine sterling silver. For proper maintenance, pieces should be polished once or twice a year, whether or not they have been used regularly, in order to maintain their shine. These pieces should be hand-washed only; hand wash and dry immediately with a chamois or soft cotton cloth to avoid spotting. Styled in the lavish Baroque manner, this highly collectible pattern is our best seller. Introduced in 1941, it captures classic symbols of the Renaissance in the exquisitely carved pillar and acanthus leaf curved as in nature. The sculptural, hand-wrought quality is evident in the playful open work and intricate, three-dimensional detail, which carries to the functional bowls and tines, and is apparent whether viewed in front, back, or profile. 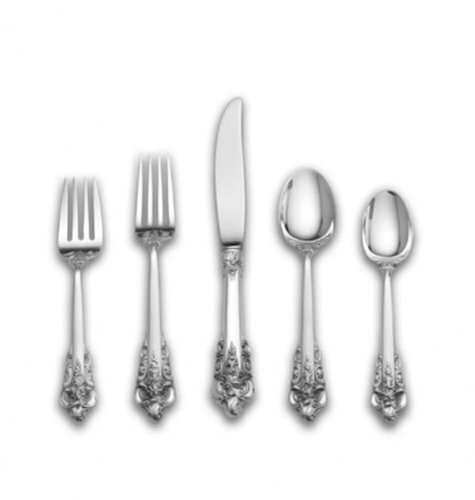 Perfect for traditional and formal settings.GRANDE BAROQUE BY WALLACE Dinner Size sterling silver Flatware set - 66 Pieces. 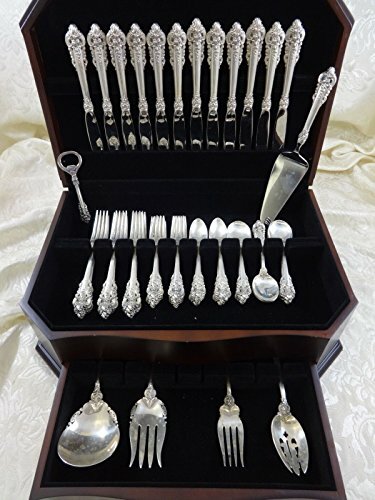 This set includes:12 DINNER KNIVES, 9 3/4 12 DINNER FORKS, 8 12 SALAD FORKS, 6 1/2 12 TEASPOONS, 6 1/8 12 CREAM SOUP SPOONS, 6 1/8 1 PIERCED SERVING SPOON, 8 3/4 1 COLD MEAT FORK, 8 1/4 1 SALAD SET, ALL-STERLING, 9 1/4 1 PIE SERVER W/STAINLESS BLADE, 11 1 BOTTLE OPENER W/STAINLESS, 5 1/4 Includes BONUS brand new storage chest. Excellent condition, no monograms. This set will be professionally polished to pristine condition and sealed in individual plastic sleeves prior to shipping. Multiple quantities (of most items) are in stock. To order more than one, increase the quantity in your shopping cart.